Valid until December 24, 2010. Please bring this coupon with you. Valid for any single Garden Center item. Coupon not redeemable for cash. for your support and encouragement during our first six months of trading. We sincerely appreciate your advice, constructive criticism, comments and your business. We hope to continue to satisfy all your garden and flower needs in the years to come. everything you ever wanted to know..
Do you have any questions or comments about Woolly Pockets? We have had a tremendous response to our display of Woolly Pockets at the store, so a sales represeantative from Woolly Pockets will be at Deep Roots on Saturday 12/18/10 between 12 noon - 3PM to answer your questions and give a demonstration. 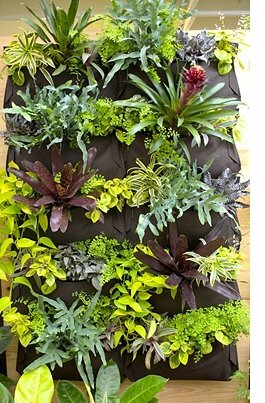 Find out more about this fascinating and innovative new method of growing plants. A Christmas wreath is a ring made of evergreen leaves, flowers and sometimes fruits, and it is used as an ornament, door or wall hanging or as a centerpiece on the dining table. 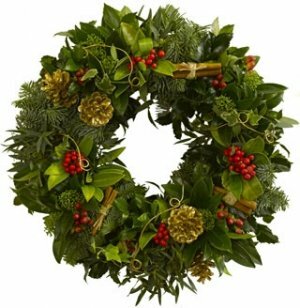 The original popularity of wreaths dates back to the pre-Christian era. Several ancient civilizations used rings of leaves or flowers in their celebrations and religious ceremonies. 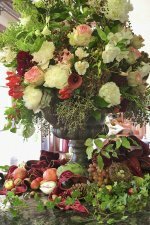 Ancient Persian, Greeks and Romans all considered wreaths to be the symbol of importance and success. These wreaths were relatively small in size and were known as "diadems". They were worn on the head as a symbol of power or honor. They were also used for auspicious occasions such as weddings or as laurel crowns awarded to athletes who came first in the Olympic Games. In ancient Rome, laurel wreaths were worn by military heroes and emperors. The custom of using wreaths was introduced to Northern Europe by Roman occupiers. Instead of laurel, local evergreens such as yew, juniper and fir branches were used in wreaths and diadems and adopted in pagan religious ceremonies, especially during the winter solstice celebrations on and around December 21. 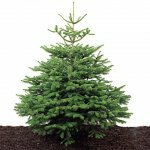 To pre-Christian Europeans evergreens symbolized the strength of life and hope of fertility during the cold dark days of winter, when other trees were bare and all vegetation lay dormant. The Winter Solstice has been a time of celebration dating back to the Babylonians. The Romans held a week-long celebration called Saturnalia, which honored the god Saturn. Held close to the Winter Solstice, it was one of a series of Roman festivals celebrated at midwinter. The festivities lasted for a week, normal life being suspended in favor of eating, drinking and giving gifts. Saturnalia continued to be celebrated beyond the Christian era, finally bequeathing many of its elements to the Christmas celebrations of today. With the spread of Christianity the evergreen wreath, as well as the Winter Solstice celebrations were adopted by Christians who wanted to incorporate existing pagan customs into their celebrations, and claim them as their own. Since that time wreaths have been closely linked to Christianity. As a circle that has no beginning and no end it is a symbol of God's love and eternal life. Today wreaths are a wonderful decorative touch, and often the first sign of Christmas is the hanging of the Christmas wreath from the front door of the house. The wreath is a sign of faith in humanity and life, and of victory over life's challenges. Whether you hang a wreath on the door to welcome visitors, or on the wall to complete a room's decor the splash of color on a cold winter's day is sure to add a feeling of warmth, building excitement for the coming season. Paperwhites:It takes four to six weeks for a paperwhite bulb to bloom when planted inside so now it is a little late for Christmas. However, brighten up January gloom with pots of these fragrant flowers in your home. We have some bulbs already started in decorative and clay pots at Deep Roots, or why not buy the bulbs and start them yourself? 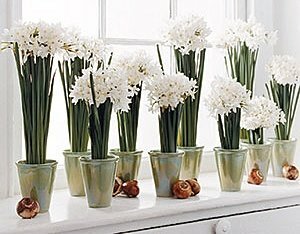 ($10 for a dozen large bulbs). Adding a little vodka (or rubbing alcohol) to the water will prevent the long stems and leaves from flopping over. Amaryllis: An Amaryllis flower is gorgeous and a pick-me-up in the dead of winter. How to make your amaryllis blooms beautiful not just this year, but for many years to come? At first glance, amaryllis bulbs seem to be expensive bulbs. After all, unlike tulips and daffodils you are only getting one bulb for your money. But think again. What other bulb can give you so much winter pleasure? And can you think of any more dramatic flowers? 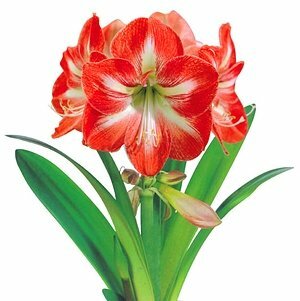 Did you know that with the right treatment that amaryllis can bloom this year - and every year following. It may even divide and multiply so that you end up with lots of amaryllis bulbs. Despite rumors to the contrary, amaryllis bulbs are quite eager to bloom for you. Have you ever noticed them in the supermarkets, the long bloom stalk trying to push the lid off of the package it is in? That is not a fluke. These guys love to flower! When you get your bulbs, plant them in a pot that fits it rather snugly - there should be no more than about an inch of room between bulb and pot. Be sure there are at least 2-3 inches of soil beneath the base of the bulb, and leave the neck of the bulb exposed. Use a soil-less potting medium , because it is light and drains well - and most bulbs require excellent drainage. Water the bulb lightly. The mix should be damp, not wet. Then take the pot, bulb and all, and place it in a cool, dark place. Keep an eye on it. Soon you will begin to see growth. When that happens, bring the pot out into the light. To reduce any possible stress on the plant, do it gradually, doing from dark to dim and finally to light. At this point you can begin to water it again, adding a small amount of fertilizer. Once again - make sure the soil is moist but not wet. Now - just stand back and watch. Pretty soon the bloom stalk should begin to grow taller and taller - and finally the bud will swell, and before you know it - your amaryllis is in bloom! Enjoy it. Wrap some velvet fabric around the pot and tie it with a gold bow - amaryllis make great holiday gifts because they bring such cheer to winter. When the blooms start to fade you will notice the foliage beginning to emerge. Now is when we start to prepare your plant for next year. Continue moderate watering and feeding. When the flowers wilt, cut the entire bloom stalk off - but leave the leaves. The plant gets the energy to flower because those leaves absorb nutrients and deliver them to the bulb. You want to pamper those leaves as if they were precious. Take them outside for the summer. Don't forget to feed them - but lightly. By fall, the leaves should start to die back. Let them. Do not cut them off until they are yellow and quite ugly. (This is a good time to start returning them to their original dark hiding place.) Remove the leaves when they are completely shriveled. Then put the bulb and pot away and forget them. Well - don't TOTALLY forget them. Check the bulb every couple of weeks until you see signs of life. Do not water it. Let it stay in the dark. The bulb is resting, gathering energy. And when it has gathered enough it will signal you with emerging green growth. That is when you start the whole process again. Every year. If you have been faithful with your watering and feeding that bulb should reward you annually. Some may even surprise you by sending up a flower in mid-summer. And eventually they will produce small offset bulbs that you can detach and pot up. These baby bulbs won't be ready to bloom for about three years but hey - for all practical purposes they are free! So that's all there is too it. A time in the dark, an hour in the spotlight and a summer of energy-gathering is all you need to keep that amaryllis going on and on and on. For years we were warned that poinsettias – those beautiful red and pink flowering plants we display at Christmastime – were poisonous. Parents magazines, medical books and guides, and even doctors and veterinarians cautioned us to keep the beautiful plants out of the reach of children and pets for fear that they might nibble on the flowers or the leaves which were believed to be toxic. In fact, some books still indicate poinsettias are poisonous. Thanks to more recent testing, however, it is no longer necessary to keep your beautiful poinsettia plants out of reach. The long-standing belief that poinsettias were poisonous has finally been proven to be nothing more than a myth – a false alarm. According to a source at the Poison Control Center in Madison, Wisconsin, most of the fear originated from the death of one child in Hawaii in 1918 who was believed to have eaten a poinsettia plant. However, experts are no longer sure this death really had anything to do with the ornamental plant. In fact, a research study conducted at Ohio State University in more recent years reveals that poinsettias are not truly poisonous at all. The study conclusively proved that all parts of the plant are non-toxic. Today the National Capital Poison Center in Washington, DC and poison control centers across the country list the poinsettia as a non-poisonous plant. According to the Madison Poison Control Center, a 50-pound child would need to ingest 500-600 poinsettia leaves to suffer ill effects of any significance – which is highly unlikely to occur. Of course, minor gastrointestinal upset may occur if a child or pet consumes the leaves, as with the consumption of any non-food product, but the plant is not a deadly poison as previously thought and will not kill a child or animal. In the worst-case scenario, the child or pet could have an upset stomach, vomiting, or diarrhea – all treatable using over-the-counter products. This was further confirmed when the Children’s Hospital of Pittsburgh and Carnegie Melon University conducted a study of almost 23,000 poinsettia exposures reported to poison control centers across the country and found that none presented evidence of actual toxicity. Playing with the leaves could cause local minor skin irritation in humans, and children who play with the leaves and then rub their eyes could experience redness and irritation of the eyes. To prevent further irritation, eyes should be rinsed with lukewarm water for 10-15 minutes, and hands or body parts irritated by the plant should be washed well with soap and water. 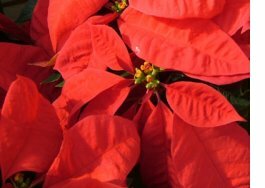 However, ingesting poinsettias is not shown to cause several stomach upset, convulsions, or other symptoms requiring emergency care. Probably the greatest threat the plants pose is the potential to obstruct a child or pet’s airway, causing choking. This holiday season, everyone can sit back and enjoy the beauty of poinsettia plants without a worry. Caution should be exercised with other ornamental holiday plants and even some normal houseplants, however. Just because the poinsettia has been “cleared” doesn’t mean all other plants are just as safe. Various parts of some plants – including holly, mistletoe, English ivy, azaleas, rhododendrons, philodendron, and others – can cause severe reactions and may be fatal. If in doubt, check it out. Better to be safe than sorry! Giving the gift of an expensive bottle of wine this Holiday Season? Then you will need a classy, contemporary wine sleeve to wrap it in! We have Torre and Tagus woven metallic mesh wine sleeves for sale in our gift shop (pictured left). They come in two colors: silver and multi-toned black/silver/bronze. At $8.99 this is an affordable and welcome gift for Christmas or New Year. 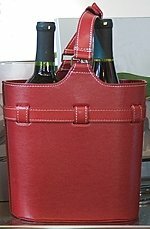 If you are giving TWO bottles we also have beautiful red leather wine caddies, pictured right. Our fabulous "Best Christmas Trees in the South Bay" are flying out the door! Sales are extremely brisk so if you want one of our pampered trees come and get it soon! We have obtained all the finest quality trees we can and we won't be getting in any more. There are other trees available to us but they do not meet our standards and we won't sell inferior trees. Hurry in for the best selection of our third and final shipment. How do I keep my tree alive longer? You can't!! Technically they are already dead... But you can keep them looking fresh longer and reduce needle drop. Spraying the tree with hair spray gave the best results! It kept the most needles on the tree and it stayed a good color. However as this added significantly to the fire hazard they strongly discourage doing this. Spraying with polyurethane did nothing to prevent needles drop. Adding fertilizer gave the worst results, causing the most needle drop. The bleach and crushed Viagra caused the least amount of needle drop they but turned the trees a strange color. Adding lemon-lime soda or aspirin gave the same results as plain water. What they did NOT try was the Christmas tree preservative that we sell at DEEP ROOTS. Called "Keeps It Green", which acts the same way as flower additive and not only extends the life of your tree, retards needle drop, and reduces the fire hazard but also diminishes the amount of bacteria in the water. At only $1.99 a bottle it is well worth it. .. candles that is!!! 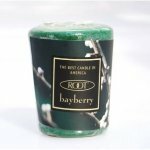 Root candles are special..."The Best Candles in America since 1869" it says on their brochure! Root candles combine an exclusive all natural blend of beeswax and other premium natural waxes enhanced by pure essential oils. Fall and winter is the home fragrance season when Root brings back for a limited time and in limited quantities such mouth watering fragrances as Pumpkin Spice, Cranberry, Hollyberry, Bayberry, Spiced Pear and Fig, Tangerine Lemongrass and Midnight Orchid to name just a few. Available in several different sizes, infuse your home with the scents of the season. Deep Roots Holiday Home & Office Decorating team were honored to be asked to provide the floral decorations for one of the gorgeous homes on the Manhattan Beach Sandpiper's tour last weekend. We also decorated the Christmas tree, hung garland and set up an "orangerie" on the patio. The Holiday Decorating Service has one or two opeings for the week of 12/13 - 12/18 but otherwise they are fully booked. For more information call Lisa 310-379-3634. 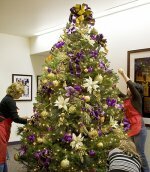 Below is a photo of Lisa, Isabel and Ramona decorating the Christmas tree at the Lakers office in El Segundo. But perhaps you should continue watering your containers.... and fertilizing your citrus trees...or pruning the roses? How about pruning your fruit trees? Spraying with dormant oil... OK there is a lot to do but it can wait until next month. Brand new and on display in our flower shop - hand crafted one-of-a-kind jewelry made from sterling silver, bronze, vintage beads and old clasps by local artist Pamela Velarde. For the past few months Pam has been creating a new range of necklaces, bracelets and rings for us from her original designs based on our collection of succulents. 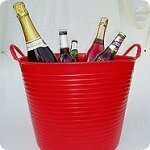 I want at least one of these useful and versatile plastic carry all tubs for Christmas! Flexible, versatile and convenient—Tub Trug does it all! Better than a bucket for all sorts of garden and household jobs. Use them for organizing piles of toys and for collecting cans and bottles. Fill them with laundry, fire wood, wash your feet or even your baby in them. Fill 'em up, pick 'em up and go. Flexible, sturdy handles let you carry with one or two hands, one person or two. With a capacity of 150 pounds, Tub Trugs can take the punishment. In the garden, fill Tub Trugs with water and give potted plants a good soak. Collect weeds for the compost pile or carry tools in it. Fill one with ice and beverages for Holiday parties. Deep Roots has Tub Trugs in two sizes in red, yellow, green and blue — cheery colors that don't hide in the garden. The perfect gift for the gardener in your life.